Please confirm your donations to the contest. I will be publishing a final version of the contest details this coming Sunday 11-1-09. Details of how you want any contest to run. The main advert banner will be as follows. Whatever logo or style you submit should be clean and preferably on a black background or transparant. I will create or scour your site if one is not submitted. Dates and prize details will be adjusted. A small logo is available here. Cut or modify as needed. A Sprout (a small flash advertising banner is on the atlas on the main page. You may republish this if you want to. Here is a picture of it. Note the white sprout logo on the bottom cannot be removed. edit: code deleted, the size may change and i plan to use this as a feature to the daily contests of what people can enter (some of which are sooner than the 'official' contest date'. Please review the Full sized Sprout which will be published this sunday for pre-advertising. Prizes and contest dates will be adjusted as needed. I'm specifically trying to get RSS on the first weekend and FOE on the second weekend as they are the biggest contributors.. All other dates are subject to change. Provide anything specific that you want to 'fits' in the template. If you have extended text you'd like there, I can added a text scrollbox. These are just initial details... an advert basically. You will also be able to republish this Sprout on your own site. I can update and make changes on the fly to it and it will automatically update on all sites carrying the sprout. edit: code deleted for this as the sizing may change to be larger... i'm trying to avoid that but want to preempt hopefully any issues... if you've already 'loaded' it in, it may need to be changed. RSS: I need your saturday party details to include on the main advert banner. I'm trying to crank out extra Dune Buggies beyond the two i'll have tomorrow... as fill in prizes in case there are no shows. I will try to get extra clans to participate if need be at last minute or may just plug the character planner or database as a contributor. I've contacted the new forum person who seems in charge of contests to request FE prizes. Please include how you'd like the contest to run. So we can coordinate rules and judging if need be... if nothing is requested, a simple /enter contest with random winner will be done. If you want people to go to your site, I can provide a graphic or you can modify one for any type of 'password' and use that as an email link for those site visitors to enter your contest. If you'd like to do something completely different or independent, let me know... i can just funnel them to your site and you can run the whole contest if you choose and i'll just act as an ad vehicle to drive traffic there. If you want it can also be something like a /enter but also include a requirement to 'describe your character in 1 sentence' kind of thing or anything. Questions? Let me know. I'm sure this will be an adventure. While I may not be directly in contact with you all, I'm still working on this hard. Please try to have a contact person pop in here, especially in the few days before your particular contest to iron out any problems. This is a 'contest on the fly' partly due to it's nature, so there may be hiccups but we will get those sorted fast... i just need someone to ask at your clan if you personally aren't going to be checking in then. Contests will run on Eastern time and be posted at midnight and general close at midnight as well. GTA can decide how the prize can be given away. I can confirm I have the cargo motorcycle key in my vault as our donation. I'll send in a banner shortly, although that size is unusual so I'll have to do one up. I'm not sure exactly what would be a good contest, at first impression I thought the Atlas was running all the contests, and I kind of preferred it that way as we don't have any good ideas. /enter is a little boring though. 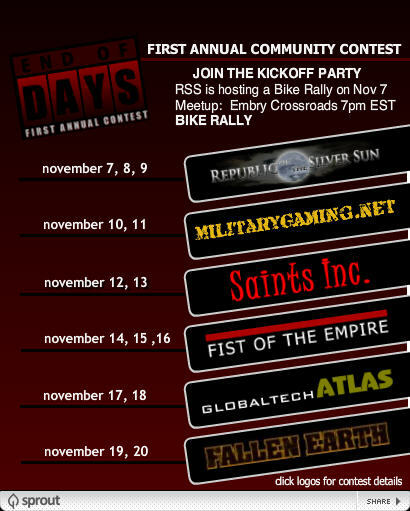 Maybe given the dates MilitaryGaming.net's event is running (Veterans' Day), we could have some military trivia or such? oh we can run all the contests, just an option. I'm putting together the semi-official final list of dates and contests this saturday... it will be published on sunday, but there is still some room for tweaking after publishing, but i'd like to keep that for a minimum. I 'may' need to adjust the days allocated to 2 each. Probably will go for a 'prize every day' (and that's about 16 days... and for those who have offered a single prize, don't worry, it's taken care of)... a simple trivia question or /enter type on the first day and a screenshot contest on the second. (screenshot contests would be published in advance and be open to early entries... the second day might be a voting day or, depending on preferences, just a winner picked (though judges should be impartial like a 3rd party radio station or something like that). The more complex it is, the harder it is too coordinate and run. 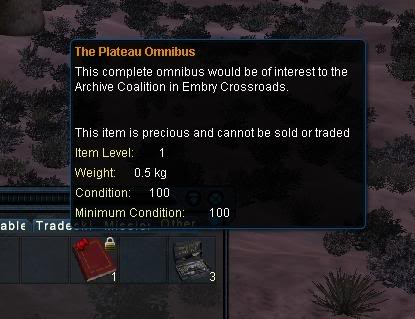 I'm keen for screenshots on paring them down with or without clan input to a select few and putting it to a user vote. (this may not be the best way to go... it's all new to me too, but seems easier. Simplicity is key. Screenshot contests reduce the number of entries, probably dramatically, but can you imagine 500 entries? I can. It's a bit scary, but that can be handled too. Which is why i want at least a 2 day contest per group (one easy entry and one with a bit of effort). As for our own contributions. There doesn't need to be a hard end date so we can keep adding if any other groups want to contribute (but it is probably getting near the limits of my patience and endurance) . it is being publicized on the atlas now with 2 small banners as teasers and it is published on the events calendar on the official forums. I'm still working on getting some FE official contribution.. but... ?!? Fist of the Empire [FoE] is confirmed to still be in this. We will provide the banners ASAP getting in touch with the right people now. Here is just one possible combo of this we could offer. We will also provide the details of a screenshot contest when the banners are submitted. Our contest will request a screen shot of the moon and the answer to a question about our lore. (question pending). I'm assuming the screenshots will be sent to Global Tech. Will they be hosted somewhere for RSS to view /judge them? We will be placing a single clan leader in a randomized location in Sector 1, Sector 2 and Sector 3 all at the same time. We'll be scouting some landmarks in certain areas. We will then be systematically releasing riddles, screenshots, and generally anything else that could potentially clue people in on our location through the Fallen Earth Forums, the T.A.O forums and the T.A.O wiki. We'll also be taunting people in /region to encourage people to find us, while pointing to the FE forums post for people looking for clues. As time progresses, we'll be making the riddles/clues less vague, thereby making it easier. That way somebody is guaranteed to win. Just give us a time/date when you want us to collaborate, and we'll get everything set up by then. So, kickoff or finale? Choice is pretty much up to you. screenshots will be hosted and accessible to all viewers and judges as they come in... updated daily.. Otherwise i will try to create a simple contest individual to each contributor. and a day of effort... like a screenshot contest or whatever. The contest details can be worked out but if you all have something in mind, please let me know in the new thread. I have a terrible memory and while i remember ideas, i do not remember who they go with. Any given Saturday/Sunday would be perfect for us. The 20th and 21st work for FoE. Thanks again for all the hard work from GTA. We should have our banners ready in a day or so and will promote the contest on our websites and youtube (through comments and video info). We would like to do our 1st day with a prize of the weapon and accessories and the second day the prize will be the weapon AND the armor both with accessories. 1st day contest: Simple question: "What do you like about PvP in FE?" I hope this is all agreeable and if we missed any details or dropped a stitch just let me know. Thanks for letting us participate in one of the best MMO communities evah. absolutely that works.. i want to fit in your own flair to the contest as you can come up with better contests than I that actually mean something to you or support your individual goals. We can absolutely have you judge the contest.. both if you like. If you can get a pvp inclined mod to judge the first one, that'd be great but there is a limited timeframe of about an hour from 11pm to midnight for those daily contests to be judged or awarded. Same with the screenshot... i'll post all in a public folder so everyone can see all entries by player name. I'd like to restrict it to one entry per person and will... but there is no way to verify somebody didn't submit 4 entries.. so we have to deal unless i'm missing something which i'd like you to point out. For the screenshot contest, I'd much prefer to have a shared account so I can post all the entries but still lets you see all of them. This would be an email (gmail probably) created just for this contest and the passwords shared with you (unless you want to share your password with me and i doubt that)... if you have an alternative, please let me know how you can judge and pick, but i can still get all screenies... if you want to post them yourself, that is fine in some public thing like picassa. We must preserve all entries for posterity. There could be 5 screenies.. there could be 500. I'm sure there are public group upload sites out there, but i am not yet familiar with them. I'd like to post entries as i get them... the screenshot contest will run 2-3 days (2 days without a public vote). This lets people start to see things and can build interest. I'd prefer not to 'spill over' into the prior groups days but it's possible. Would like to avoid beta shots as bugs may make things funnier.. prefer live game bugs or live shots. Some type of 'shared' resource for entries would be preferred. I'm glad those dates work well.. wanted to keep you on a weekend even though slightly tweaked. on the second day, Would it be winner take all or 1st 2nd 3rd? Anyways, fantastic idea. I need to step up my other contests i have to run.